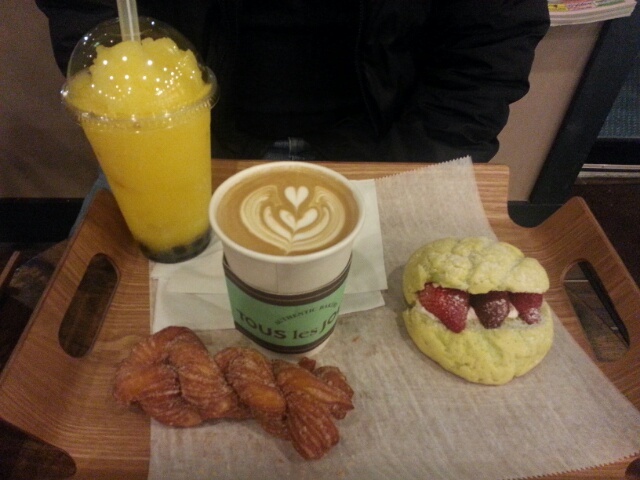 Tous les Jours is a beautiful new Korean bakery lighting up Route 40. I’ve been there several times now, because I love it, but it does have two negatives. One is that they are so popular that it’s sometimes hard to find a place to sit, and as for the other, well, I’ll get to it later. Tous les Jours is apparently an outpost of a well-established chain, a bakery/coffeehouse hybrid like Shilla, Bon Appetit, etc. The bakery area is very approachable, always very well-stocked with (delicious!) tasting samples; the drinks I’ve had so far have been delightful, although the ordering process has been somewhat complicated by the fact that I seem to get a newbie cashier almost every single time. The first I heard of them was when K came back from running errands, toting a big bag of bakery goods. I was impressed with how good the food looked. I was even more impressed by how good it tasted. Living close to Rt 40 as we do, I’ve tried a lot of Korean bakery items, and I think Tous les Jours is my favorite bakery so far. I particularly loved the one bun that was completely round, with a crispy shell and a chewy filling; it reminded me of dim sum sesame balls, but bigger (and without sesame). The croquettes were warm and toasty when K brought them back, too, because hot items are kept inside a little warmer oven. Very thoughtful. They also bake their bread fresh. I’ve been there first thing in the morning (they open at 8, which is not the friendliest time for commuters), and saw several trays of bakery items heading out of the kitchen; the place smelled heavenly. The picture below is from an evening when we headed over for dessert, and enjoyed a mango bubble tea (K) and a mocha (me). K chose an item that we both agreed was pretty much a twisty, bent churro. I picked my pale green “melon” bun in an effort to try new things, and because I loved how it looked: like it was baring its teeth at me. Its tasty, pointy, cute little strawberry teeth. It was soft in texture, with an almost cream-cheese-like quality, and an interesting light tangy taste from the melon. Besides being beautiful, my mocha was also quite satisfying, with good flavors of coffee and chocolate. K’s bubble tea was nothing to write home about, unfortunately; the flavor was good, but the tea shares the same weakness as most of the bubble teas I’ve had at other local establishments. The tapioca pearls were inconsistent in texture, some hard and pebbly, some soft and almost too goopy: the mark of bubbles that are not fresh. You want bubbles that are chewy but not hard, sweet but not sugary. These felt like they had been improperly prepared, or were sitting around too long. Anyway. Not going to knock Tous les Jours on their bubble tea, since apparently my standards are higher than what’s available anywhere in the area, but you can be sure I’ll be sticking with the non-bubble drinks in the future. “The bad news,” I said, because I like things to end on a high note. “That’s not… so bad,” I said. It was about 10pm. I mean, we ate there anyway. The food and drinks were delicious. But, yeah, bit of a sour note there. In sum: I know I said some negative things about Tous les Jours, but honestly, I’m actually really in love with the place. The bakery items are all fantastic, the coffee drinks are wonderful, there’s plenty of seating and the decor is calm and comfortable. I’d recommend it to anyone. 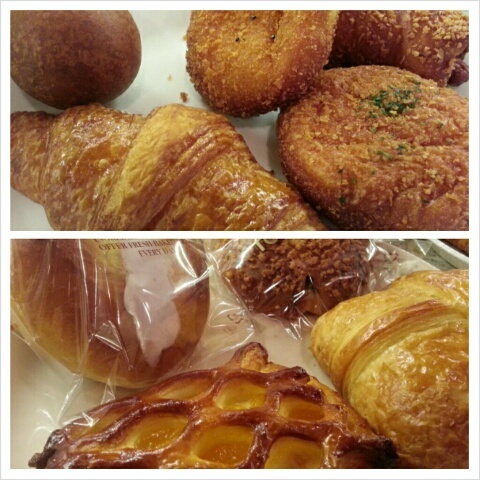 Tous les Jours is on Rt 40, across from Shilla Bakery, behind Lighthouse Tofu. I love that Breezy Willow’s spring CSA co-op reaches all the way down to Florida; these ruby red grapefruits are amazing. 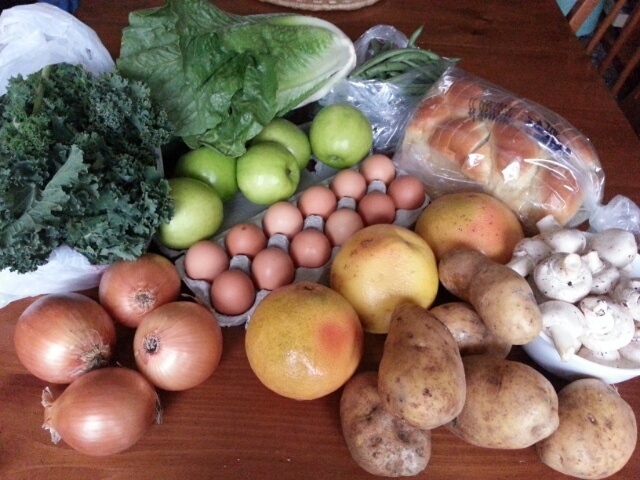 This week in the CSA: kale, romaine lettuce, green beans, Granny Smith apples, yellow onions, ruby red grapefruit, gold potatoes, mushrooms, eggs, and bread (Great Harvest challah, again). I think tonight will be a good night for one of my favorite simple dinner salads: crisp romaine lettuce, with shredded cheese and a fried egg. I like cooking the egg just over easy, so that the yolk flows out and dresses the salad leaves. The Little Prince is a big fan of over easy eggs as well, often demanding plenty of “egg sauce”. He loves shredded cheese, too. If only he would accept the salad part of the meal with equal enthusiasm. Every four weeks, along with the delicious vegetables, fruits, eggs, and bread, Breezy Willow throws in a locally-sourced “bonus” item. 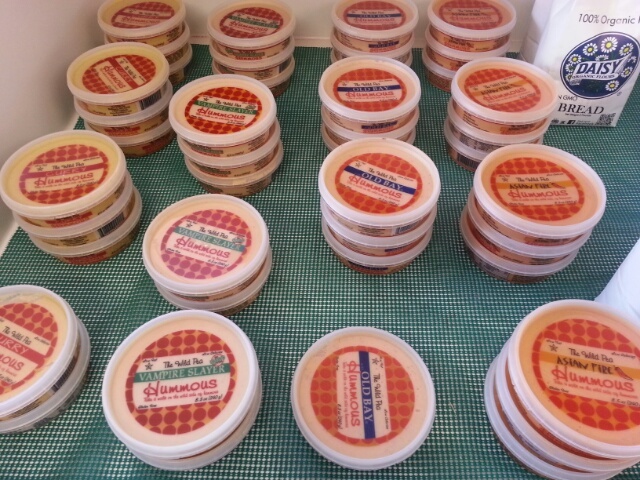 This week, it was Wild Pea hummous. 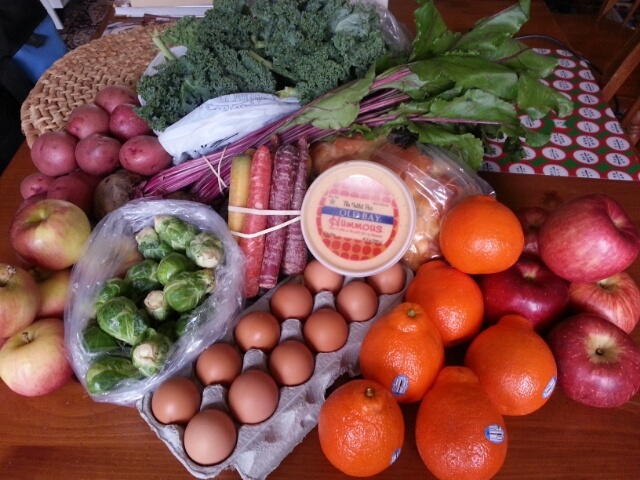 The full share: kale, beets, red potatoes, rainbow carrots, Brussels sprouts, apples (7 Fuji, 5 York), Minneolas, eggs, and bread (I picked Great Harvest challah). 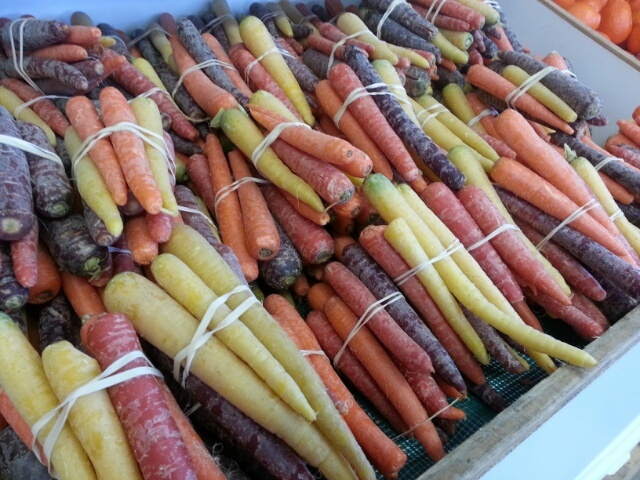 I also had to get another shot of all those gorgeous rainbow carrots. I think the rainbow carrots are always so pretty – not just the colors, but the unique shapes. I read an article recently (NPR: Think Nobody Wants to Buy Ugly Fruits and Veggies? Think Again) about how “ugly” produce is saved from waste bins, and when I looked at the pictures of the ugly produce, I was shocked. They looked perfectly good! Then I remembered that whenever I go back to produce-shopping in the winter, after the CSA has ended and the farmer’s market has closed, I’m always a little put off by the shiny perfection of the vegetables. All the carrots are straight, all the apples are round and shiny, the greenery gleams with freshly-sprayed water droplets; if something is bruised, crooked, or dirty, it looks out of place. It’s like shopping out of a catalog: unreal, almost plastic. 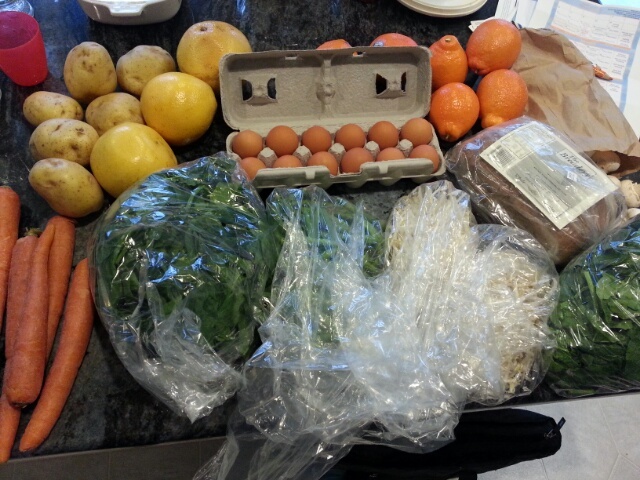 Poor lumpy, dirty vegetables; in that context, I can understand why stores wouldn’t stock them. But they’re just as tasty, and I really do feel closer to the source of my food when I peel a crooked carrot, or flick a little green worm off the tip of my corn cob. It’s good to know where your food comes from, and all the different shapes in which it can present itself. And imperfections can actually be good indicators of quality. My dad used to say, whenever I found an apple with a hole pecked out of it: good choice; the birds know which apples are the tastiest. 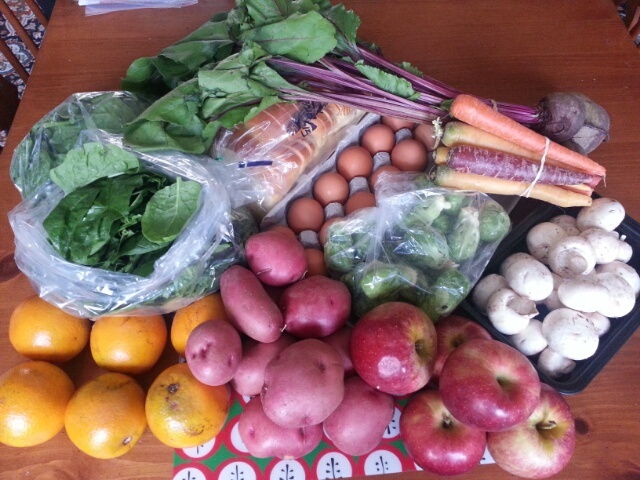 week 3 of the spring CSA: gold potatoes, carrots, ruby red grapefruit (3), minneolas (6), spinach, green beans, bean sprouts, mushrooms (in the brown paper bag), eggs, and bread (Breadery cinnamon raisin walnut). Already cooked (though not yet eaten): all of it! This past Saturday I decided that I was sick of all the uncooked produce in the refrigerator, and in a frenzy of industry, I stirfried the bean sprouts, wilted the spinach, and sauteed the mushrooms, wiping out the Dutch oven between batches (fewer dishes). The carrots and potatoes went into K’s slow-cooker chicken curry, and the eggs into a big breakfast scramble with some shredded cheese and leftover barbecue meat. The fridge is now full of easily microwaveable side dishes, instead of produce that demands cleaning and chopping before it can be consumed. In a household with two working parents and kids that need to be fed immediately after coming home in the evenings, this sort of prep is key to retaining sanity. I am a little disappointed with the bread, though; it crumbled a bit too easily and fell into pieces in the toaster oven. Too dry, I think, even though we carefully kept it twist-tied in its paper bag. Guess I’ll avoid it the next time around. 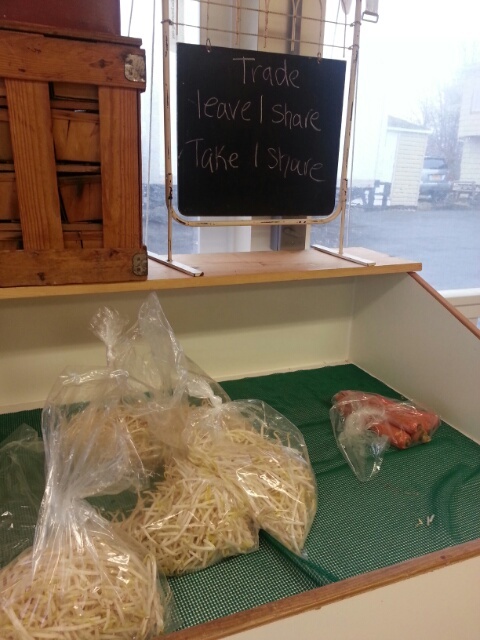 The major pitfall of the bean sprouts is that they go bad really quickly; turn your back for a few days and they’ve gone all brown and slimy, and before you know it you’re throwing away food and feeling horrible about it. Just wash them and eat them raw as a snack or in salads, or stirfry them and eat them alongside, well, practically anything. Their taste is clean, bland, and inoffensive; mix them into your cooking and I guarantee you’ll barely notice their presence.